This important work by Dr. Beach is the first volume in the significant "Reformed Historical Theology" series, published by the prestigious German publisher Vandenhoeck & Ruprecht. The series aims to publish substantial texts in the historical theology of Calvinism and Reformed Protestantism. In Volume One, Dr. Beach discusses Turretin's exposition of the twofold covenant of God, the covenant of nature and the covenant of grace. 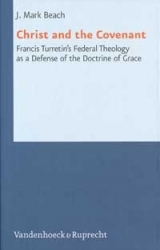 Not only does Dr. Beach contribute to an understanding of Turretin's theology in particular, but he also evaluates the validity of certain trajectories of scholarship pertaining to federal theology in general, showing how many interpretations of Reformed covenant theology are invalid and misinformed.